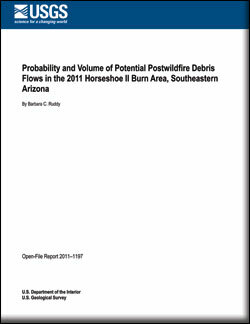 This report presents a preliminary emergency assessment of the debris-flow hazards from drainage basins burned in 2011 by the Horseshoe II wildfire in southeastern Arizona. Empirical models derived from statistical evaluation of data collected from recently burned drainage basins throughout the intermountain western United States were used to estimate the probability of debris-flow occurrence and debris-flows volumes for selected drainage basins. Input for the models include measures of burn severity, topographic characteristics, soil properties, and rainfall total and intensity for a (1) 2-year-recurrence, 30-minute-duration rainfall, (2) 5-year-recurrence, 30-minute-duration rainfall, and (3) 10-year-recurrence, 30-minute-duration rainfall. Estimated debris-flow probabilities in the drainage basins of interest ranged from less than 1 percent in response to the 2-year-recurrence, 30-minute-duration rainfall to a high of 100 percent in response to the 10-year-recurrence, 30-minute-duration rainfall. The high probabilities in all modeled drainage basins are likely due to the abundance of steep hillslopes and the extensive areas burned at moderate to high severities. The estimated debris-flow volumes ranged from a low of 20 cubic meters to a high of greater than 100,000 cubic meters. Ruddy, B.C., 2011, Probability and volume of potential postwildfire debris flows in the 2011 Horseshoe II burn area, southeastern Arizona: U.S. Geological Survey Open-File Report 2011–1197, 10 p.